The second issue of SHOWCASE featuring the All-New Doom Patrol. I have a strong feeling of having picked this issue up while at my Grandmother’s house, though I’m not 100% certain of that. It’s got a dynamic Jim Aparo cover that really grabbed me, despite the liberties taken with Robotmans new design. You can also see a bit of the Marvel influence in this piece–it really feels like a Marvel cover of this era more than a DC one. This Doom Patrol run was definitely trying to tap into some of that Marvel flavor, i think. The interior artwork was again by Joe Staton, who had a cartoony style, but one that really helped him to push the emotion of a scene. 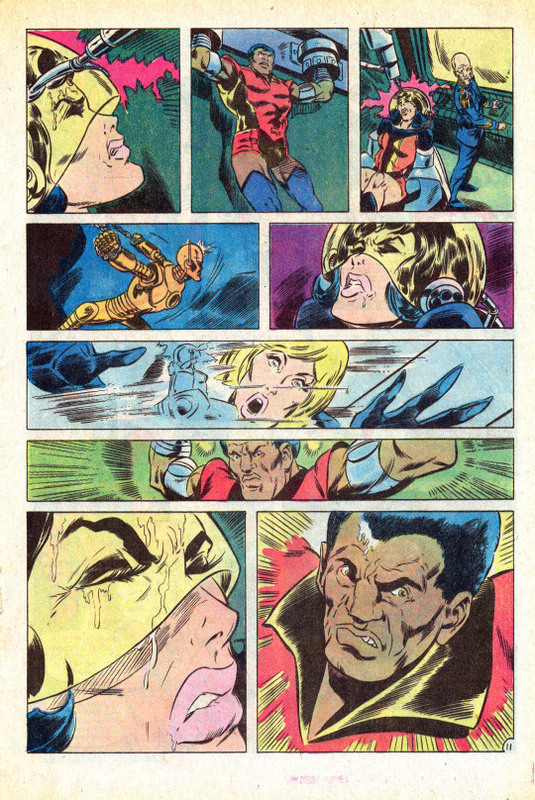 he was also playing with page layouts that were a bit more dynamic than the typical DC offerings of this period. I found his work during this era very appealing, whether on ALL-STAR COMICS, GREEN LANTERN or here working on the Doom Patrol. Sadly, the inking here by DC mainstay Frank Chiaramonte is a bit sketchy and unfinished-looking in many places, a bit iffy. 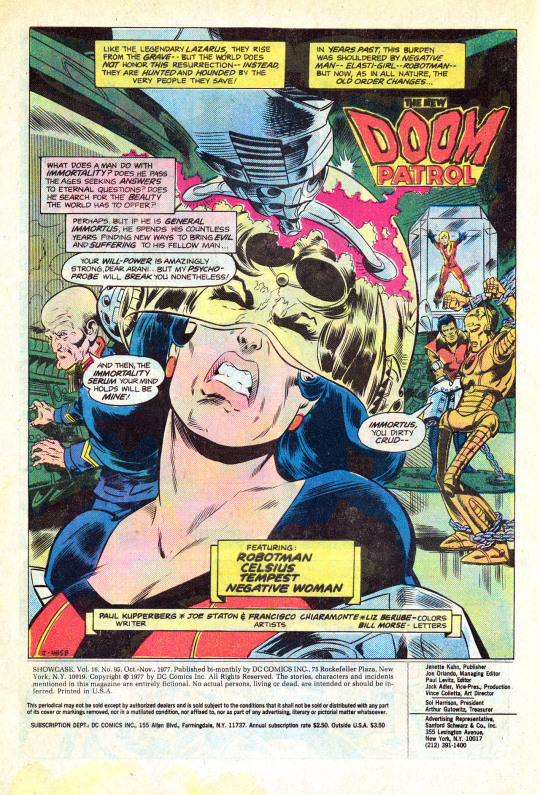 The issue opens with the new Doom Patrol captured by the original Patrol’s long-time nemesis General Immortus. 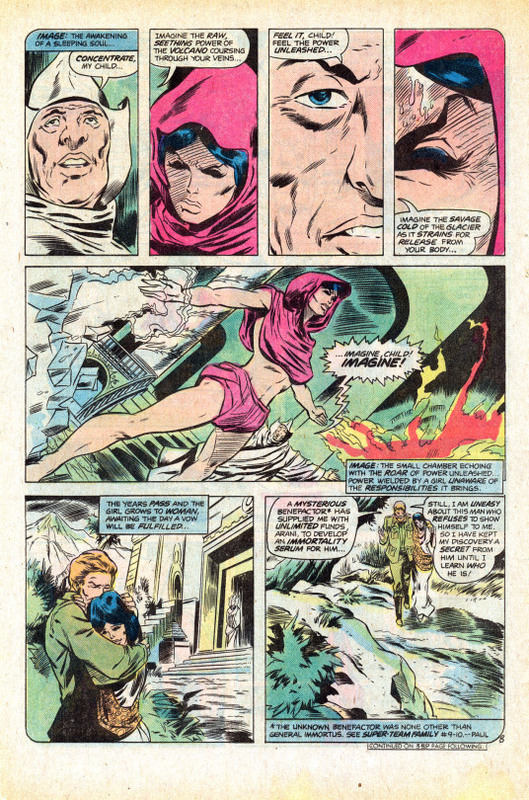 Immortus is looking for a new source of the serum that prevents him from aging, and believes that Celsius, who claims to be the wife of the deceased DP Chief Niles Caulder, possesses the formula that he needs. So he intends to probe her mind to get to the truth. 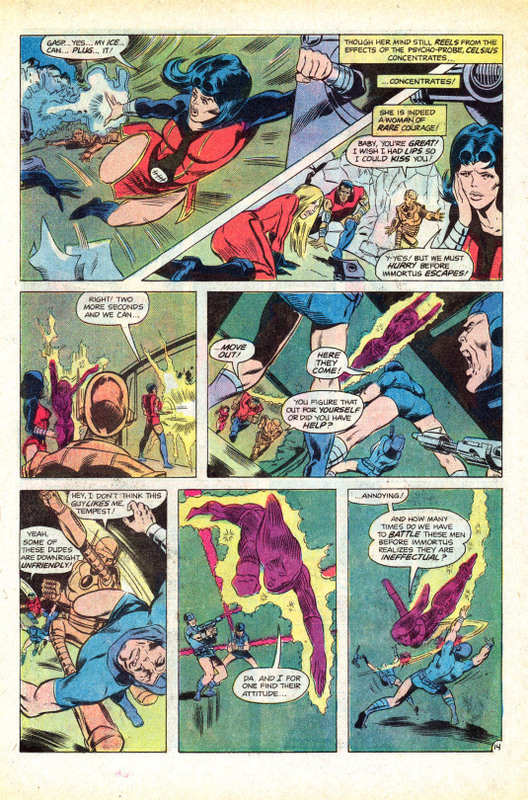 Robotman and Tempest momentarily burst their bonds and try to rescue Celsius (and to provide some up-front action before a lengthy flashback sequence) , but they are quickly overwhelmed once more. As her memories are displayed upon Immortus’ probe-screen, we’re treated to the history and backstory of Celsius. She was a homeless, starving indigent in Calcutta when then-Red Cross volunteer Niles Caulder rescued her and took her under his wing. 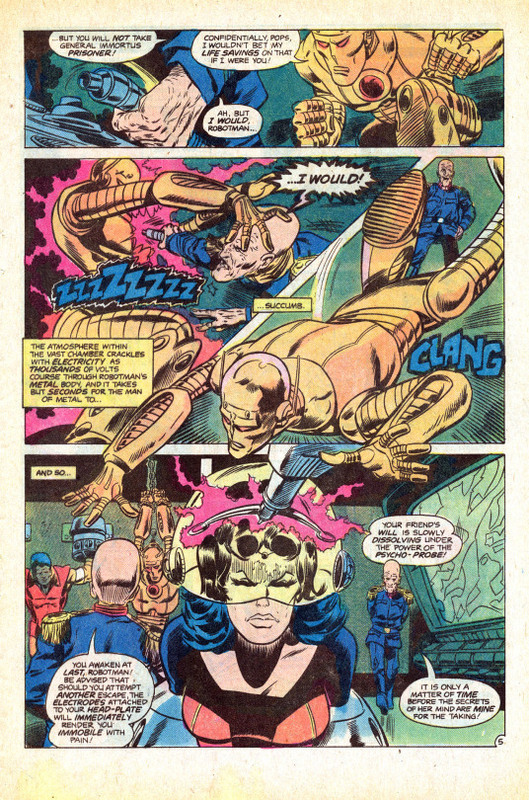 Caulder leaves her with a monastery of Holy men, who teach her to tap into the secret reservoirs of power within herself, allowing her to generate extreme heat or cold. These seem to be mutant traits in young Arani, although the text circles around the specifics of whether her abilities are ingrown or something that she’s learned to do through study and focus. In the nick of time, Tempest is able to break free, and he once again sets about releasing his fellow Patrol members. Immortus, having gotten the information that he needed, rushes off to summon his army, and Robotman figures this is a good time for the team to take a powder. he smashes his way through a nearby wall–only for the group to discover that the complex that they’re in is situated on the airless moon. Presumably, the complex has some manner of internal gravity-generator to explain why everybody didn’t immediately notice the difference between the Moon’s gravity and that of Earth. Either way, the Doom Patrol is now caught up in explosive decompression, and rapidly works to bock up the hole Robotman made. So the team needs to fight its way to an escape ship. Meanwhile, Immortus has his own surprise coming up, as he takes the serum he extracted from Celsius–and while it seems to rejuvenate him for a time, the effects swiftly reverse themselves. As Celsius later explains, the serum must be keyed to the genetic structure of the individual–her serum won’t work on Immortus. 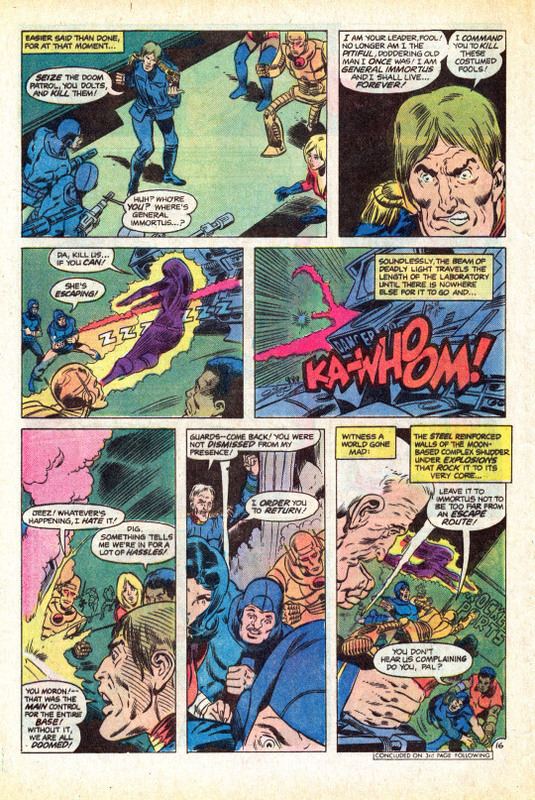 The Patrol kicks the crap out of Immortus’ soldiers, steals a shuttlecraft, and takes off for Earth once more, leaving Immortus and his men to their fate in the rapidly-disintegrating base. Arriving back in Midway City at their base, the team is surprised as Matt Cable steps out of the shadows to arrest Negative Woman. Cable had been a supporting cast member in the SWAMP THING series, so his use here is another example of the Marvel style of cross-pollinating the publishing universe, something that DC was doing a lot more of in this era. And from there, we are To Be Continued!